Auburn Rotarians Debbie Shaw and Ford Laumer presented a History of Aubie for Auburn Rotarians on Wednesday, February 3, 2015. During the program, a special visitor (Aubie) appeared and interacted with the club members. 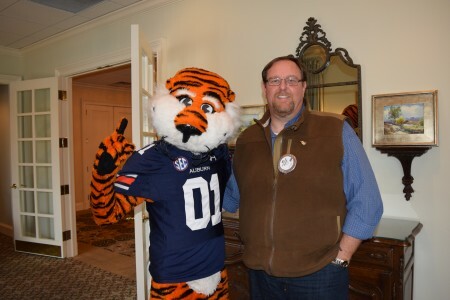 Pictured are: Judge Jim McLaughlin, former Auburn Rotary Club President (right) and Aubie (left).